LinkedIn has done it again. The platform that helps you connect with clients, future partners, leads and customers has created another way for us all to stay better connected! 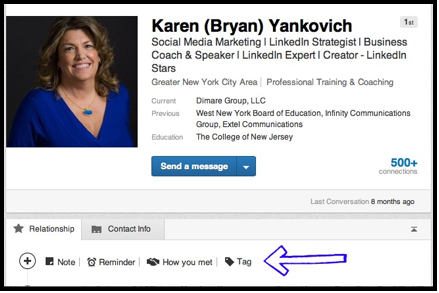 The devil is in the details, as they say, and LinkedIn’s tool will allow us (if we take advantage of it) to store all those little details about a contact in one easy to find place, details that can make a relationship stronger and longer lasting. LinkedIn Contacts has arrived and once you gain access to this feature, it can work in a major way as a Customer Relationship Management (CRM) tool. A note: ie) their spouse’s name, children’s name, passion project they are working on, or the best time/way to reach them. A reminder: ie) An appointment, meeting or upcoming phone call. One word of caution there is no flash or ding or alarm of any kind to recall this reminder without you going in and checking yourself. However this still is useful as a tracking system of sorts, keeping a history of interactions with that specific connection which can be handy when gauging interest, warmth of the lead, partnership qualities and more. How you met: This one is self explanatory and I would say vastly useful. How many times have you ended up at a function or attempted to re-connect over email wishing you could remember the details of how you met to provide proper context and better connection yet for the life of you you cannot? Yes it has happened to me too. This little feature is very helpful for an overtaxed entrepreneur’s memory. A Tag: Here you can create categories for your connections placing them in groups for easy organization, easier access, group idea generation, and bulk messaging. It is always useful to know who would like to read your latest post, sign up for your latest webinar, or know about your new job. You pick which category or make new ones that speak to your personal needs as well. 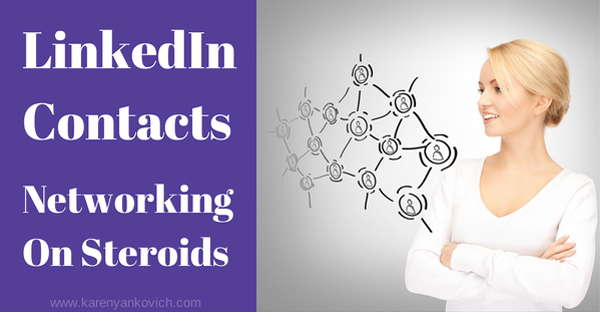 LinkedIn Contacts is like networking on steroids. Think of this as networking on steroids. Once you have all these details the next few steps are crucial, and fun! Now you have a silver bullet when engaging a connection (or soon to be connection) in a LinkedIn conversation. Send an exclusive invite to a small group of your connections asking them to join your “platinum level membership of awesome” or your “free beta-testing amazingness”. Ok don’t use those words, but you know what I mean. It’s easier for you once you have grouped them appropriately, they feel special because it’s not a mass email that has no bearing on what they want or need, and everyone wins. Ask for recommendations! Send a little note to happy clients and ask them to add a recommendation to your profile. Include a reminder noting when you did this so you don’t keep bugging them if they don’t respond. Comment on your connections updates! Tag them as “good to comment on” because their field is similar to yours, or because they always engage back with you, or because they are an expert you admire. Then send a little note with a few details and ask them to guest blog for you, or ask if you can guest blog for THEM. The possibilities are endless. Before you do any of this always, always make sure your profile is complete and polished. Think of what you would do for an interview and create the same vibe for your profile. You wouldn’t wear frayed shorts and no shirt (aka have old outdated information and missing profile sections) to your future career interview or client meeting would you? Well ok you might if it was MY dream retirement job: sitting on a beach! But the point remains, you never know who is searching for you. It could be your next amazing client, your next fruitful partnership, or your future book deal, and if your LinkedIn profile doesn’t show a clean, classy, and clever picture of your professional history and who you are today, you could end up losing this new contact and you would never know it. Plan for your ideal future! Take the first step today by joining my LinkedIn group where you can ask all the questions you need to feel confident you are connecting in the right way on LinkedIn. As always: to your success! Thanks, once again for the LindkedIn reminders! It is always great to read your posts so I can remember to get in there and update! Wow! It’s like the modern day Rolodex file! 🙂 Thanks, Karen! That’s a HUGE update! With all of the connections we make on LinkedIn it’s good to be able to make notes on who/how we connected. Thanks for more great info Karen!! Great advice, Karen. Opens my imagination to a day when I’ll have more LinkedIn connections than I can keep track of in my head! i especially like the the benefits you outlined for the “how you met” feature. thanks, karen! I really have to set aside a day to implement these strategies. I received most of my sign-ups from LinkedIn from my very first launch.